Whether you're baking Christmas biscuits, homemade rolls or potatoes having a good baking tray is essential. The Tefal Easy Grip Baking Tray could be just what you are looking for. 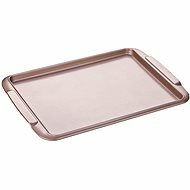 This baking tray is exceptional because it is made of high-grade carbon steel and is therefore robust and long-lasting. Plus, it has a textured non-stick coating which means that you no longer have to scrape your recipes off the bottom. The large handles make it easy and comfortable to use. Do Your Recipes Stick to the Bottom of the Tray? Do your recipes stick to the bottom and are difficult to remove from the baking tray? With the Tefal Easy Grip Baking Tray you no longer have to worry about this problem. Its structured non-stick coating makes cooking easy and successful. Having the right kitchen utensils makes baking really fun. For shipping to other EU countries visit this page Tefal Easy Grip Baking Tray 26,5x36cm. Für Versand nach Deutschland, besuchen Sie bitte Tefal Backblech von 26,5x36cm EasyGrip. Chcete doručit zboží do Česka? Prohlédněte si Tefal Plech na pečení 26,5x36cm EasyGrip. Chcete doručiť tovar na Slovensko? 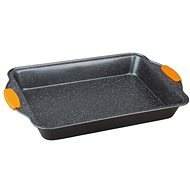 Prezrite si Tefal Plech na pečení 26,5 × 36 cm EasyGrip. Für Versand nach Österreich, besuchen Sie bitte Tefal Backblech von 26,5x36cm EasyGrip. Magyarországra történő kiszállításért tekintse meg ezt a termékoldalt: Tefal EasyGrip 26,5 x 36 cm.